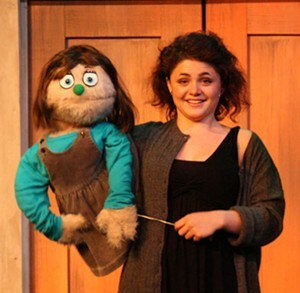 Since making her Theatre Charlotte debut back in May as Kate Monster in Avenue Q, KC Roberge has shown up everywhere this past summer. So aside from the altruistic monster teacher's aide, if you got out at all this summer, you may have seen KC at Central Piedmont as a pesky, larcenous pre-teen in Wait Until Dark, a savvy HR supervisor in How to Succeed in Business Without Really Trying back at Theatre Charlotte, or as a somewhat slutty stitcher in The Pajama Game with her hometown Davidson Community Players. Not yet 19, Roberge has astonishing range and appeal, plus a preternatural voice that pierces like a drill bit.